Hope's Cafe: Nick Chavez Hair Care Review and Giveaway!! I'm sure most of my readers have heard of Nick Chavez before. Well, I recently had the opportunity to try some of his fabulous hair care products, and I really like them! I was sent the Volumizing Shampoo and Conditioner, Volumizing Extra Hold Hair Spray, and some sample packets of the Angel Drops with Argan Oil, and XXtreme Body Styling Glaze. I was very anxious to try these out, and wasted no time in using them the next morning! Obviously, I started out by using the Shampoo and Conditioner. The shampoo has a very delicious citrus scent, and works great. A rich, easy lather that doesn't require a ton of shampoo. It leaves my hair feeling very clean and fresh. Then, the conditioner. Again, you only need a small amount. I was a little worried, because my hair is very dry...I can hardly skip one day without using a moisturizing conditioner, or my hair gets frizzy and hard to deal with. 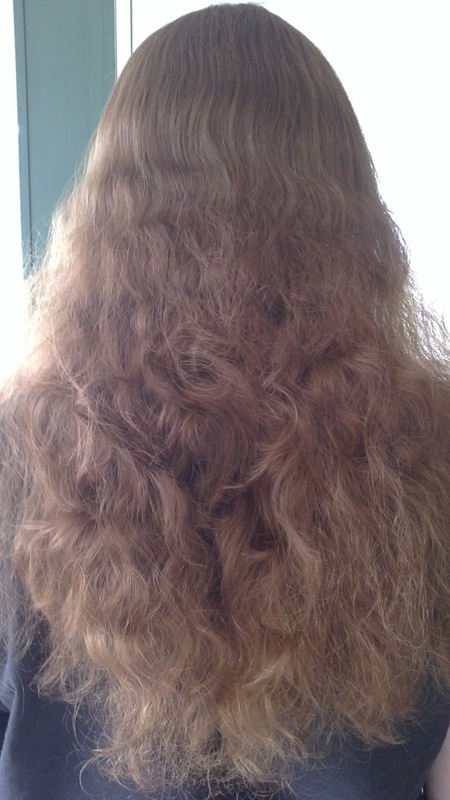 So, I was anxious to see how the volumizing products would work on my hair. After the first day, my hair still felt silky and smooth, with no frizz. I thought "wow, if it feels this good after one day without a moisturizing product, maybe it'll really work!". Sure enough, after a couple weeks of using these, my hair still feels as good as when I was using deep moisture products! I am amazed to have found a volumizing line that provides a deep conditioning! So, I get the benefits of a volume-building product without losing the moisture-a definite winner! The hair spray gives a really nice hold without a "plastic look" as my little sister says! It keeps my wavy, often-frizzy hair in order, and doesn't weigh them down at all. The Angel Drops is a pre-syling product that provides moisture, strength and shine to your hair. I really like this product! And, lastly, the XXtreme Body Styling Glaze is awesome! It leaves my hair with a sleek shine, some extra body, and holds off the frizz! "As a young boy from Yuma, Arizona, Nick Chavez dreamed of one day having an exciting, glamorous life. Being the second-oldest of seven children, Nick was no stranger to hard work as one of the family’s ranch hands. But it was his skill at grooming the family’s horses and his determination and confidence that led him to grow. Armed with just his scissors (and a fierce sense of style), Nick took his natural talents to the next level by creating hip, trendy hairstyles for his siblings and members of his extended family. After honing his talents on his now very receptive relatives, Nick made the jump to California, where he immediately began working in a prominent Beverly Hills salon. Nick quickly advanced from apprentice to full-fledged hairdresser, developing a strong clientele and an even stronger reputation. In addition to his prominence as a hairstylist, Nick’s highly successful line of products is currently sold at Ulta retail stores, across the United States, and is featured on home shopping channel’s such as QVC (U.S.) in the United States and internationally, on QVC (Germany), QVC (Japan) and The Shopping Channel in Canada. 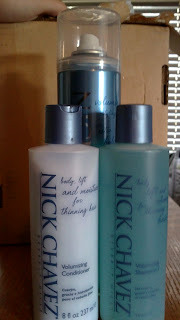 In addition, Nick’s products are widely sold through the internet and can be found on such e-commerce sites like beauty.com, dermstore.com, folica.com, qvc.com, and of course nickchavezbeverlyhills.com." One of my readers will win the Volumizing Shampoo, Conditioner and Hair Spray!! Go to Nick Chavez Beverly Hills and tell me which product or line you would like to try most! 1 entry-Follow Nick Chavez on Twitter! 1 entry-"Like" Nick Chavez on Facebook; tell them a product you'd like to try, and that you came from Hope's Cafe! This giveaway ends Monday, March 28, 2011, at 11:59 p.m. Please leave a valid email address in each comment, as this is how the winner will be notified. Winner will have 48 hours to respond, or another winner will be chosen. Giveaway open to US residents only. Disclaimer: I was not monetarily compensated in any way for this post. All thoughts and opinions are mine. All quotes taken from the Nick Chavez Beverly Hills website. I would like to try the volumizing extra hold hair spray. I would love to be entered in this giveaway! I think the Ultra Glaze looks good. Please enter me. Thanks! Entered Vaultz CD Wallet giveaway. I would love to try the Scrunch Spray for curly hair! I would love to try the Volumizing Gel Mousse. I "Like" Nick Chavez on Facebook, told them a product I'd love to try and that you sent me. I would love to try the Volumizing Extra Hold Hairspray! I'd really like to try out the Thirst Quenching line! My hair is really curly and frizzy, I need to try this out! I commented on your Joe Shopping post! I commented on your Miche Bag post! I entered the Progresso Prize Pack Giveaway,too! I'd like to try the Ultra Shine Honey Peppermint Shampoo. I entered the King Arthur Flour giveaway. I would love to try the Nourishing Value Set shampoo. The amazon infinity mist looks interesting.